The perception of Ivanka Trump’s clothing line by consumers of all three political affiliations is starting to converge, according to YouGov BrandIndex. 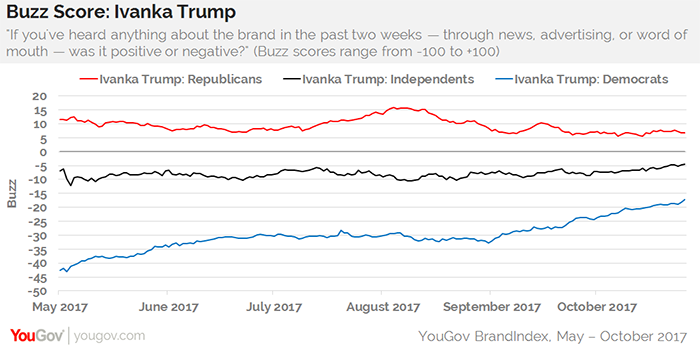 Democratic and independent consumers have been slowly moving their perception of the Ivanka Trump brand in a continuous positive direction since late spring, while Republican perception of Ivanka Trump has distinctly cooled since YouGov BrandIndex began tracking it in May. Despite rising during the first half of this past summer to coincide with the publication of Trump’s book, Women Who Work, those numbers slipped and are now tracking below May’s levels. 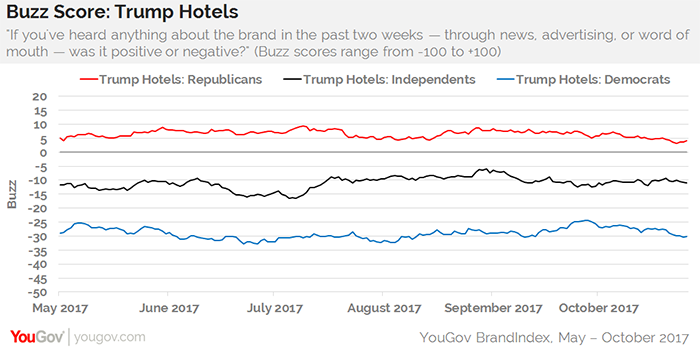 On the other hand, perception of Trump Hotels and Resorts remains polarized, with Republicans leading in the low positive feedback range, independents in with middling negative numbers, and Democrats with deeply negative numbers. Despite Ivanka Trump’s unexpected improvement with Democrats and independents, both Trump brands are in the bottom 10 of the more than 1,600 brands that YouGov BrandIndex tracks daily with consumers age 18 and over. Accordingly, Trump Hotels and Resorts places far behind its high-end rivals such as Omni Hotels and Ritz-Carlton on such metrics as Quality, Value, and Satisfaction.